Quite possibly your best post ever. Ever. My sense is that it was Islam at work, but there are other groups that could be at work. I used to watch Fox until I realized it isn’t a conservative source of news – it is just less liberal then CNN. Sheppard Smith is an idiot and is there for one reason and one reason only. Being a New York liberal himself he doesn’t get the concept of Notre Dame or religion – he can only frame it in terms he understands – putting people first, not God. Since then I cut the cable and don’t have an antenna so I don’t pay attention to these fools. France doesn’t have cheap Mexican labor for these kinds of jobs. They have Algerians, Syrians, and Tunisians. So they had the roof of Norte Dame literally crawling with Muslims and it burned down. We’ll see if the French have the guts to gt to the bottom of it. Heartsie has a picture of a Muslim guy making his way out of the Cathedral as the fire gets going. BTW, i despise the ground Shep Smith walks on. Speaking of Mexicans on the roof: the small, 150 year-old church I grew up in in suburban Atlanta was burned to the bricks by a Mexican on the roof with a torch. I say Mexican because roofing in the Atlanta area is one of the jobs Americans won’t do. A tough, old, long-time member of the church was in charge of the restoration and got the insurance company to source stained glass windows from France to replace the beautiful originals. The interior was restored to its original configuration, not the ugly changes of the ’60’s. Ironically, a few years later, the church was de-consecrated in moving, once-in-a-lifetime service due to changed demographics in the area. Not to compare my hometown church to Notre Dame, but the current situation has resonance with me. Watching CNBC at the gym last afternoon/evening I knew immediately that it was Islamic Terror. They ran a little footage, talked about containment and then they didn’t say what is ALWAYS said when there is a large or significant fire. They didn’t say that the cause was unknown or under investigation or will be investigated or anything relating to cause. They know who burned it and being submitted to the House of Saud for the loot it provides through their Sovereign Wealth Fund the French leadership will cover it up. Burning churches and attacking Christians and Christian symbols is a centuries old tactic of Islam but the ‘news’ will breathlessly ‘report’ that there must be some other explanation. Wu…wu…wut could possibly be the cause with these young men that seem disgruntled and angst filled? Yes, it’s a psychological problem they proclaim, a war for the right to rule men by their civilizational standards being a consideration that’s simply off the table. Macron claims it will be restored and rebuilt. Anyone else think the rebuild will include a dome somewhere, in the name of diversity and inclusiveness? Honestly, I think it was deliberate, by izzies. If so, the gov. will never let the truth become public, although, even if it did, I don’t think it would change the path that France has chosen. They are too far gone. Extremely Unlikely this Wasn’t Arson – Easy to Blame the musloid Invaders, but I see it as Far More Likely a French/E.U. “government” Operation, to draw Attention Away from the “Yellowjackets” anti-government protests. Some of these protests have included Anti-Immigrant and Pro-Nationalist elements, much to the Terror of the Satanic/Homo/Pedo/Moneychanger ‘leadership’ in France. It is an Obvious, Symbolic Target, and it is already being Used by the French government as a 9/11(tm) Style propaganda ‘event’. As for the many Articles about the Occult/Satanic/Catholic ‘connections’, I’ll leave them to those who find it Interesting…. “Operation Gladio” is All one needs to Know about ‘Terrorism” in Europe. – Is this realistically a possibility in France for White Christian congregants who are not politically connected? I am not trying to be “smart” with this question, just trying to be realistic. Somehow, it just seems to me that if gun ownership were a possibility for the masses in France, those guns would be showing up on the streets and getting aimed at cops by yellow jackets who are getting grenades thrown at them by .gov thugs. Of course you’re right. I’m referring here to Americans who are reading my post and thinking through this for their own churches. 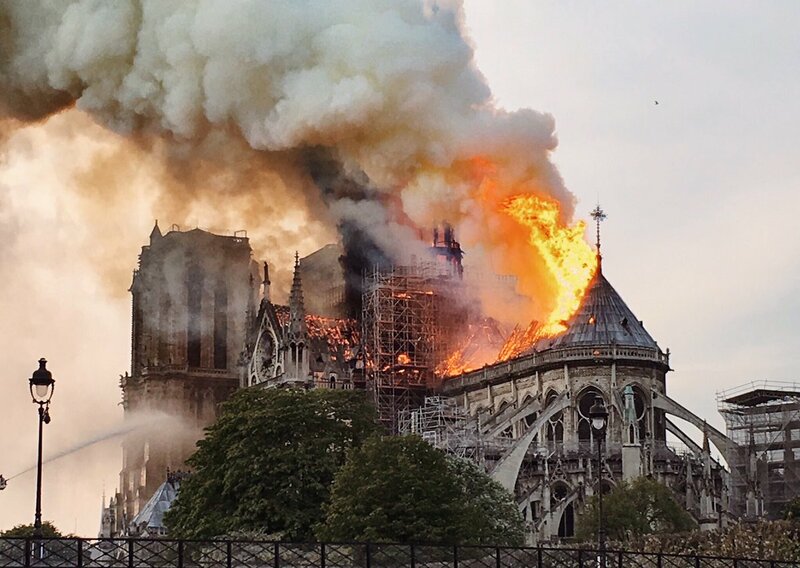 The Notre Dame Fire is not an “Outlier” in terms of Anti-Christian acts…. No reporting of this in the (((corporate))) Media, just like with all the “Yellow Jackets” Protests. You are currently reading "The Burning Of Notre Dame", entry #20992 on The Captain's Journal. This article is filed under the category(s) Religion and was published April 15th, 2019 by Herschel Smith.